I had a fabulous night sewing last night, I actually got so much done. I got the binding sewn on my Fat quarter shop 2013 Block of the month, I even spent an hour towards the end of the evening hand sewing down the other side. I'm not a big fan of binding but I'll keep plodding along when the mood strikes. Last week I taught a class at Patchworks plus, we did the jelly roll quilt called Jelly bean by Thimbleblossoms, Here is my version. I actually used all my fig tree scraps and cut them to size. I also made it much bigger than the pattern, It with Sarah now waiting to be quilted. I can't wait to show it to you when I get it back. Its so pretty. For something completely different I am making a halloween quilt, I am loving working with these fabrics, Unfortunately I ordered some more but they got lost on the way to Australia so now I'm not sure what to do. The fabrics I have here came from a layer cake I bought and some very kind International friends sent me a few pieces. I have made around 10 blocks but wanted to make about 30. I'll have to have a rethink on this project. I'm a bit worried about ordering more and the dollar isn't as good as it was when I bought the other fabrics. Today I went to a Friendship quilting day and I helped Sarah in her stall for the day, it was such a fun time, I caught up with so many people I hadn't seen for ages. 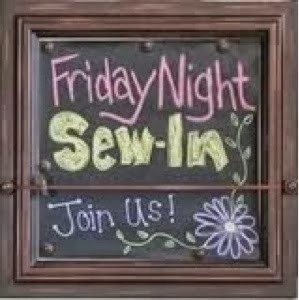 Thankyou Wendy for hosting another successful sewing night, if you would like to see what everyone else got up to with their sewing, click here and go to the list. Beautiful work Leanne. Hope you are able to get some fabric for your Hallowen quilt. Beautiful quilts Leanne. Such a shame your fabric went missing. Hopefully it will turn up. I ALWAYS buy fabric because I love it! That is the best fabric to buy! Love those pinks! Beautiful projects you have going on there. Wow! I love it all those fabric on the fat qtr shop quilt really are lovely aren't they. Such a shame about that Halloween fabric - it really looks wonderful especially using the economy block. Adore your jelly rol quilt too. Can never go wrong with fig tree fabric. your quilt is just lovely..... I love those soft colours and a great pattern... sad about the lost fabrics.... and yes, I have bought fabric just because Iliked it.... I thought we were supposed to in order to be considered a true artist? HaHaHaHaHa..."Do you ever buy fabrics just because". Ummm...yes! I'm sorry your fabric went missing. Is it lost forever? or is there still hope? Looks like you had a pretty good FNSI. You were busy, Leanne. I haven't touched my BOM since I finished the blocks and now you're stitching down the binding! I love the fabrics you bought. You certainly had a productive night. Shame about the fabric - those Halloween blocks look lovely. My goodness you got a lot done, love both quilts :) Barb. Hi Leanne - YES!! I do indeed buy 'just because' fabrics, & eventually figure out what to do with them. lovely quilts. Shame about your lost fabrics. Oh, I hope your fabric turns up! And yes, I buy fabric just because...but not so much lately as I'm trying to use stash, so I'm pretty proud of myself for not buying much lately. Your quilt is so pretty. Love all the spring colors. I like the fussy cutting you are doing on your Halloween quilt blocks, very cute. I beautiful selection of new fabric. Have fun.